The second day of WEST ESSEX MODELRAIL 2011. 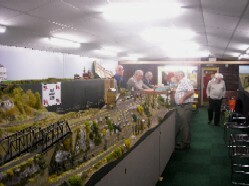 The first day of WEST ESSEX MODELRAIL 2011. 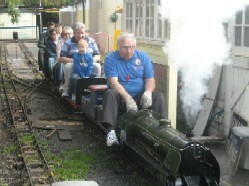 This was our sixth and final Steam Day of 2011. We were still restricted to running out-and-back, due to the scaffolding on our site. Despite all this, we still had quite a good day, and would like to thank everyone who has supported us throughout the year. See you all again in April. This was our fifth Steam Day of 2011, and despite the restricted running (due to the ongoing works at Chadwell Heath station, part of our site is covered in scaffolding! ), and also despite the rapidly changing weather, we were running full trains all day. 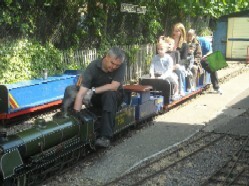 This was our fourth Steam Day of 2011, and probably the busiest we've ever had. Non-stop full trains all day! Unfortunately, since the usual photgrapher (that would be me!) was busy on guard duty all day, there are no photographs. This was our third Steam Day of 2011. After an unusually quiet day last month (some big wedding going on, apparently) we had a busier day this month - visitors dampened but not deterred by the occasional shower towards the end of the afternoon. 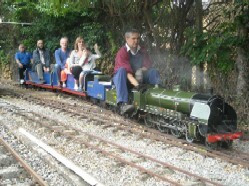 This was our second Steam Day of 2011, and somewhat quieter than usual. This was our first Steam Day of the 2011 season, and our first club open day since the improvement works to our club house and grounds. Despite problems with the points, the new wagons, and the locomotive itself we managed to get through a full day's running. Our apologies to those who didn't get in as many rides as they wanted to! We'll be doing our best to rectify all the problems before the next Steam Day on Sunday 01 May. The late, late Christmas Party 2010! Following the recent renovation work to our club house, we held a combined 'belated Christmas' and 'house warming' evening on Wednesday 03 March. This was our first opportunity, since completion of the work and setting up the layouts, to really stop and enjoy the new improved club room and its facilities.